November 19, 2018: IRCN Seminar - "Exploring the Associations between Brain Development and Psychiatric Disorders by Using MRI Techniques"
Registration:　Please register from here. Brain development and psychiatric disorders may be highly associated in humans. 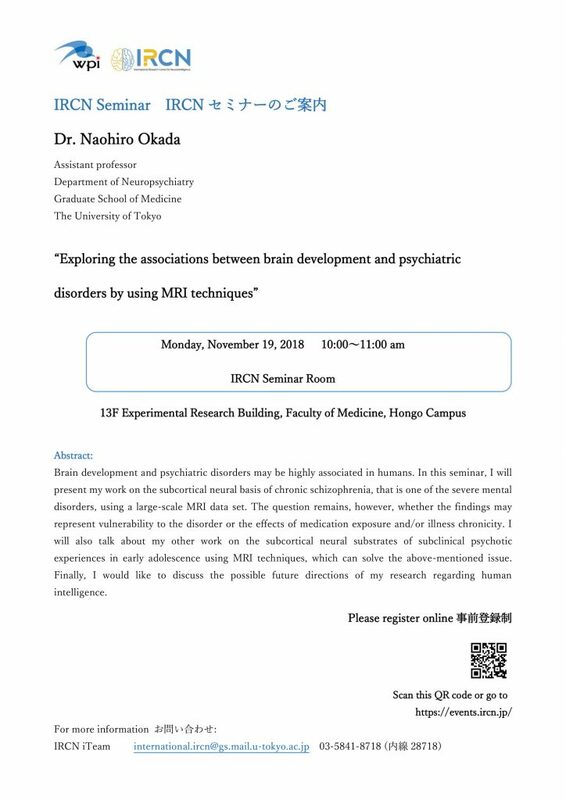 In this seminar, I will present my work on the subcortical neural basis of chronic schizophrenia, that is one of the severe mental disorders, using a large-scale MRI data set. The question remains, however, whether the findings may represent vulnerability to the disorder or the effects of medication exposure and/or illness chronicity. I will also talk about my other work on the subcortical neural substrates of subclinical psychotic experiences in early adolescence using MRI techniques, which can solve the above-mentioned issue. Finally, I would like to discuss the possible future directions of my research regarding human intelligence.